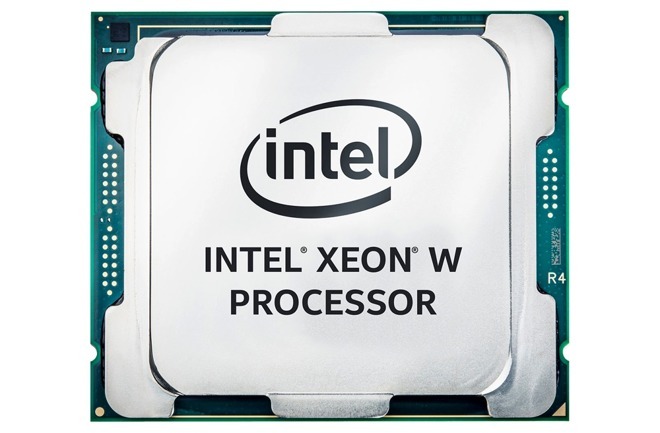 Intel has revealed its new collection of Xeon processors aimed at workstations, with the Xeon W range boasting 48 PCIe 3.0 lanes and up to 18 cores on a single chip, making the new processor line prime candidates for use in the upcoming iMac Pro due in December. The new Xeon W processor range is claimed to provide a 38 percent improvement on the previous generation, which Intel suggests is effectively an 87 percent performance improvement on processors released 4 years ago. For the latest version, the Xeon W range offers up to 18 cores and 36 threads, with clock speeds of up to 4.5 gigahertz under Turbo Boost Technology 2.0. Using an optimized 14-nanometer process, all chips within the Xeon W range use the LGA2066 socket, with 48 PCIe 3.0 lanes, AVX-512 acceleration, and support for quad-channel DDR4-2666 ECC memory across the board. Starting from 8.25 megabytes in the base models, the amount of L3 cache increases with the number of cores in the chip, up to 24.75 megabytes in the 18-core Xeon W-2195. Across the entire Xeon W range, Intel has set the thermal design point (TDP) of the processors at 140 Watts, aside from the two quad-core offerings rated at 120 Watts. Intel has priced the Xeon W family starting from $294, with the quad-core Xeon W-2123 offering base and boosted clock speeds of 3.6 gigahertz and 3.9 gigahertz respectively, a TDP of 120 Watts, and 8.25 megabytes of L3 cache. While Intel has not revealed how much the 14-core and 18-core processors will cost, the 10-core Xeon W-2155 is priced at $1,440. This new Xeon processor family is fairly likely to be used by Apple in the iMac Pro. Apple has so far confirmed that it would be using 8, 10, and 18-core Xeon processors in the iMac Pro, with all three core counts appearing within the new chip collection. The Xeon W processors are not the only new launches for Intel, as it revealed its Xeon Scalable Processors, codenamed "Purley" in July. Meant for use in workstations and servers using multiple sockets, the Purley chips use a mesh-based architecture for decreasing latency between processors, rather than the ring-based architecture previously used by Intel in the last eight years. While the Purley processors are meant for high-intensity tasks, such as those found in data centers, they also have the potential for use in workstations for video editing and other computation-heavy applications. Though this could indicate they could be used by Apple in its high-end systems, Apple's iMac Pro reveal used the singular form of the word "processor" instead of a plural, strongly suggesting it will not offer the iMac Pro with multiple processors. The current roster of "Purley" processors includes 8-core and 18-core chips, but not the 10-core processor that Apple said the iMac Pro will offer. This omission in the Purley lineup makes the chip family less likely to be used. Apple's tendency to go for processors with lower TDP ratings also gives the Xeon W range an edge over the Xeon Scalable Processors. The Purley range typically has a TDP higher than 140 Watts, rising to 205 Watts for some models, though a small number do undercut the Xeon W's 120- and 140-Watt ratings. Intel has yet to reveal when the Xeon W processor range will start shipping, but did advise the 18-core models will be arriving by the fourth quarter of 2017. This release period matches up closely to the expected December release date for the iMac Pro. Housed in a Space Grey chassis, the iMac pro will use a 27-inch 5K P3 display, configurable with up to 128GB of DDR4 ECC memory, use AMD Radeon Pro Vega GPUs, and have 10 gigabit network connectivity. Apple expects the base model iMac Pro will cost $4,999.